The 10 Best Mini Golf Courses in Oklahoma! Is there anything more classic than mini golf? It seems the deeply-rooted pastime isn’t going out of style any time soon. It’s the perfect activity to play with your friends and family, whether it’s for a special occasion or a casual night out. 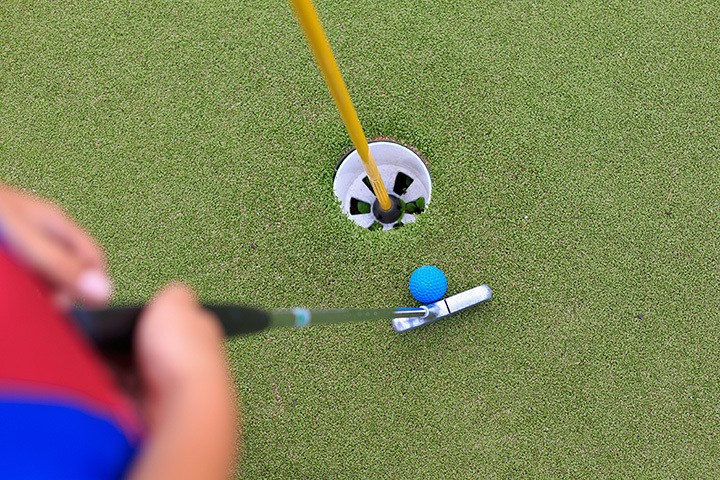 Work on your short game at these 10 awesome mini golf courses in Oklahoma! Brickopolis offers a huge assortment of attractions, but the mini golf course is one that the entire family will enjoy. Each hole is unique with a different challenge. HeyDay also has many different attractions, just one of which is mini golf. The course features 18 holes, designed for people of all levels and ages. It’s been beautifully landscaped and is ADA compliant. This mini golf course is maintained by the Downtown Kiwanis Club for the public. Although it’s only open from May through September in the evenings, it’s a great place to enjoy a family night of fun. On Thursday, it’s unlimited play. Located inside the Central Mall, Lunar Mini Golf is a course illuminated by black lights. Fun for everyone, even beginners. You’ll want to check their website for all the daily specials. On Mondays from 1 to 5 p.m., it’s all you can play for $7 per person. There are great deals almost every day at this 18-hole course. The theme of this course is Gilligan’s Island. The course is not wheelchair accessible, as there are several steps and areas which are uneven, but it’s a gorgeous course that you’ll want to check out if you can. Two by Two Putt-Putt is a Noah’s Ark themed golf course, but it’s only open Friday and Saturday. Monday, Tuesday and Thursday, it opens by appointment only. There’s a café on site, with food and drinks. Celebration Station has two 18-hole courses. Both courses have been creatively designed for players of all skill levels. Check the website for specials. On the weekend, they have evening all-you-can-play special pricing, but there are also coupons and great deals on other days. This golf course is themed around historical locations on Route 66. It’s completely glow-in-the-dark and lots of fun. At just $4 per person, you can play for a long time, or check out their daily specials on the website, no coupons required. Enjoy a pizza buffet and arcade games when you come. Play miniature golf while overlooking the lake in this serene setting. It’s only $5 per 18 holes, and there’s a concession stand nearby featuring snow cones, snacks and drinks. This park has been offering family fun on Lake Murray for more than 40 years.